I'm interested in verification if the overall picture is accurate, hugely exaggerated, or even underestimating the real trend. I'm not doubtful of the correctness of the data, as the data source could be considered a generally trustworthy one. However, what I don't know is how well this data reflects the reality of students today. How "complete" is this set of data, and are the books making up the majority of that data really the same ones used as textbooks in universities and schools? In short: Are these really representative values? I also could not find the information which books exactly make up the index. In short, my skepticisms is aimed at the interpretation of the data more than the actual values used to produce it. In particular so, as the apparent 'take-home' message of the chart is very, very strong. I would say that there are similar figures showing a similar trend (source) with the statistics directly available online at a .gov website. The President of the University of Missouri System has even directly acknowledged this trend. 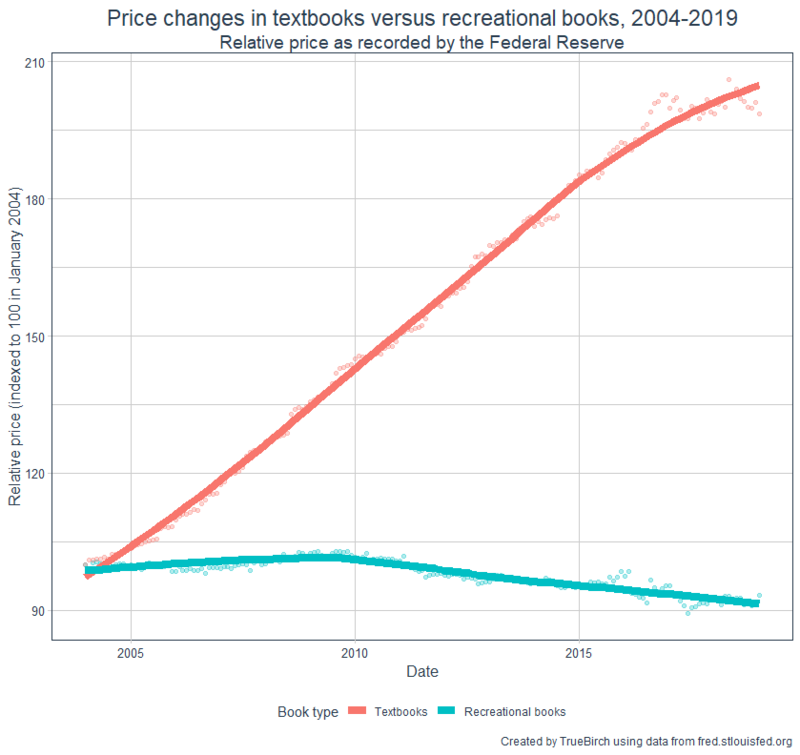 In real terms, college textbook prices have increased by 90% while recreational book prices have fallen by more than 35%...For these reasons, the four UM System campuses announced their collective commitment to adopt open educational resources. It is also referenced to by CSU Chico. Also note that the percentage values are relative to the Consumer Price Index (CPI) in 2004 rather than 1998, as in the Figure posted in this answer. Keep in mind that the cost of all items has increased in the present time relative to an earlier time (e.g. 2004), so dramatic increases may not be so dramatic on a relative scale (compared to childcare, housing, etc.). What counts as a "college textbook?" College textbooks... includes any book, which, according to the outlet, has been designated by the college, department, or professor, as a required text for a course offered by the college during the academic period. Is any weighting done or would a single super-expensive book only being used in a single college of the US contribute equally to it as a massively-used book would? Recorded price changes are weighted by the importance of the item in the spending patterns of the appropriate population group. 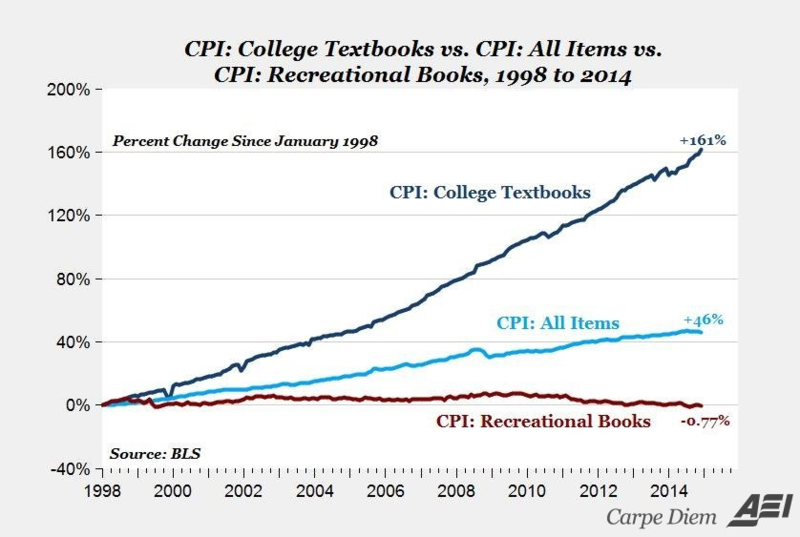 I would assume that textbooks which are frequently purchased by college students are more important in the "appropriate population group" than other less frequently purchased textbooks. So, yes, weighting is done and a single rarely-purchased super-expensive book would be given a lower weight than commonly-purchased cheaper books. Not the answer you're looking for? Browse other questions tagged united-states price .